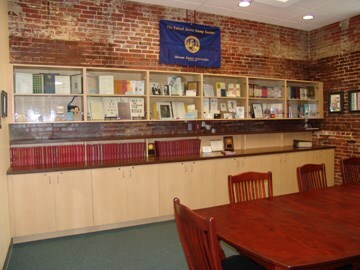 The USSS room is on the second floor of the Educational building at the American Philatelic Center, Bellefonte, PA. The room is the permanent home for the Society’s archives, society records, and awards recognition. The second floor also offers a large conference room for philatelic programs. 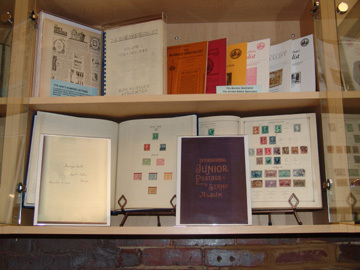 For the first eight decades of the Society and its predecessor organizations, the Bureau Issues Association and the Philatelic Plate Number Association, the Society had not had a central location to house our archives, nor a way to properly recognize those who have honored our Society. Historical documents had been stored in boxes to and moved from one basement to another over the years. Some of that material has been lost over time, but surprisingly much has survived. The USSS room at the APS provides us a place to honor our past and serve as a tribute to the accomplishments of our Society within the greater philatelic community. The proposal to fund and furnish the USSS room at the APC was agreed to by the Board of Governors at the annual meeting at INDYPEX in Indianapolis in July. One of the highlights of the room is the photo display of the inductees into the Society’s Hall of Fame. These individuals have been honored for their devotion to philatelic research and scholarship and recognized for their outstanding service to our organization. The Century of Service awardees along with the Society’s Chairmen and Presidents are recognized on special wall plaques. Winners of the Society’s most important exhibition trophies, the Hugh M. Southgate and Walter W. Hopkinson, and the Wallace W. Cleland, as well as the annual Hopkinson Literature award are honored on wall plaques. USSS historic records are safely stored in the room, and memorabilia and archival material are on display. Members who have historical material that they believe should be housed at Bellefonte are encouraged to contact the Executive Secretary. If you are planning to visit the American Philatelic Center in Bellefonte PA, visit the Society room and sign the register.